The mild winter climate of southwestern British Columbia provides ideal wintering conditions for many species of migratory birds. Several of these species are either declining or are poorly monitored, including ‘Sooty’ Fox Sparrow, Golden-crowned Sparrow and Pacific Wren are unique to BC. Programs using passive mist-netting are frequently used to monitoring the diversity, abundance, survival, and body condition of migratory songbirds, as well as the quality of the habitat they are using. The use of passive mist-netting monitoring also require mild temperatures to ensure the health and well-being of birds. The mild climate of southwestern BC provides an opportunity to conduct a winter monitoring program, using passive mist-netting, due to the mild temperatures and abundance of wintering songbirds. 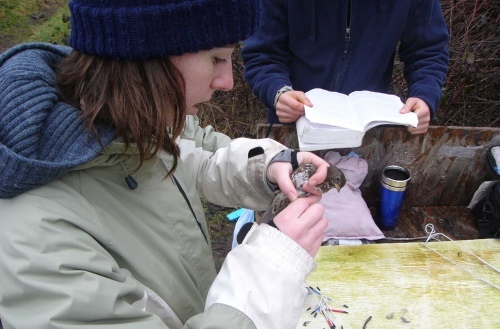 In 2010, IIBO initiated a pilot Winter Songbird Monitoring program examining the songbirds wintering on Iona Island. This is the first program of its kind in Canada to monitor the survival of these birds passively, where the use of bird feeders do not bias survival rates. We are following protocols similar to those used for Institute for Bird Populations winter monitoring programs that take place from the southern US through Central America and the Caribbean. The results of this program could pave the way for a network of stations across southwestern BC monitoring the wintering populations of songbirds. Dates: This program runs from November to March, with four days of monitoring per month, starting at thirty minutes before sunrise and running for six hours. *** Note that this program will not be running during the winter 2014-2015.